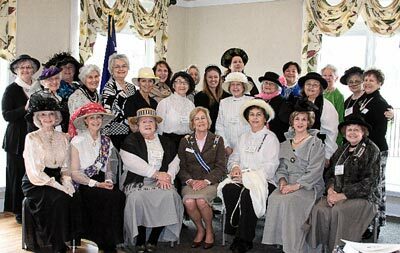 The Old 96 District Chapter of the Daughter’s of the American Revolution, celebrated their 100th year anniversary on the very day, March 14, 1914–2014 at Pine Ridge Country Club. On that day 100 years ago, Twelve strong minded and patriotic women, came together to begin an Edgefield chapter. These women and their story of fortitude reminds us of the difficulties women across our nation shared during those early years. Their story, chapter name, flower, creed and love of nation are the foundation of the Daughter’s of the America Revolution, held dear today. Since its founding in 1890, the DAR has admitted 920,000 members across the world. The National DAR recognizes Patriots not only as soldiers, but as anyone who contributed to the cause of American Freedom. Two members, Bela Herlong and Gloria Caldwell spent many hours going through Edgefield County Archives, DAR scrapbooks, letters and pictures to write the telling story of the Old 96 Chapter beginnings.